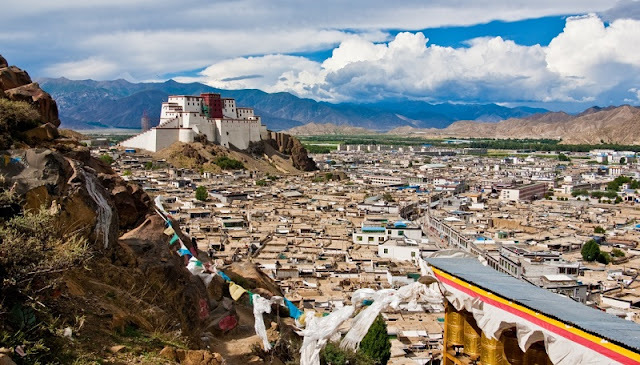 The most attractive place in Tibet is the Potala Palace. It is said that without traveling the Potala Palace, the Tibet tour is not complete. Every Tibetans regard this palace as the holiest place. And it is the home of Buddhism. If you want to visit this place, you should show your passport to the staff. After checking your information, you are allowed to enter. During the low season, the price of the entrance ticket is about CNY 100. But you still need to book it in advance. You can ask your tour agency for help. The Jokhang Temple is one of the most sacred temples in Tibet. Every year, a lot of pilgrims come here to do prayer on foot. You may meet many of them on the road to the Jokhang Temple. Outside the temple, there is a street called the Barkhor Street. After visiting the temple, you can walk along the street and buy some traditional items by the local people. You can also drink some tea and chat with your friends in a traditional teahouse. There are three holy monasteries which are worth being visited. You will leave a deep impression on the three monasteries - the Sera Monastery, the Ganden Monastery and the Drepung Monastery. When you visit the Sera Monastery, you will have a chance to visit a hot debate about Buddhism. This interesting debate is started in the afternoon every day, except Saturday and Sunday. Monks gather here to argue with each other by various gestures. There is a Tibetan traditional festival called Shoton Festival. If you visit this temple at the beginning of this festival, you can enjoy the Unveiling Ceremony of the giant Thangka of the Buddha. Located in the west of Lhasa, the Ganden Monastery was founded in 1409. It is one of the three Tibetan monasteries. You can get to the monastery from the Jokhang Temple Square. Apart from these scenic spots, you can still visit other Tibetan places like Ramoche Monastery, Tibet Museum, Mentsekhang, Lhasa Carpet Factory, Chakpori Hill, Norbulingka, and Yangpachen. Traveling to Tibet, you will be stunned by the natural views, the traditional cultural relics, and the hospitable local people.